I need a little warm sunshine on a cool Fall (almost Winter) day here. So I made this bright and cheery, not so much Fall or Winter type of card. I love how simple it was, yet it seems to be just right. I think it shows up well in the photo, but in case it's hard to see, I stamped the same many thanks phrase down the right side in Creme Brulee. Supplies used (all CTMH unless otherwise noted): Treasure Life, and Many Thanks stamp sets; Olive, Tulip, Colonial White and Creme Brulee CS; Olive, Tulip, Creme Brulee, Sorbet and Black inks; Black brads; Paper crimper (dollar store). 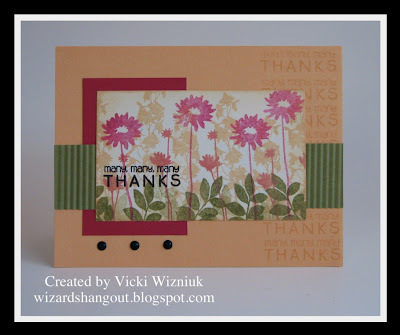 I love this flower card!! So pretty!